You are here: Home » MEDIA » Books » The Dragon’s Child by Janine Webb (book review). 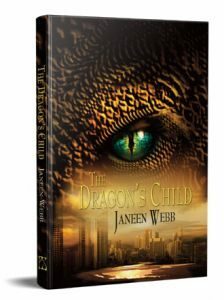 The Dragon’s Child by Janine Webb (book review). Based in a society where dragons can transform in to humans and currently control all the businesses as a result of which they are wealthy, Lady Feng accidentally kills a human child. Because of this, she feels she should replace it with one of her own children. However, Long Wei the dragon child grows up picking up a mixture of human and dragon traits. Because of this, Lady Feng and Wu Mei, Long Wei’s teacher, struggle to find a way to stop him from causing trouble. The world-building for this book, ‘The Dragon’s Child’, is intriguing. Dragons pretending to be humans is quite a fascinating idea to explore. The dragons also have interesting ideas about upbringing, such as that dragon children don’t meet their parents until they’ve successfully completed their education. This provided quite a good contrast to the traditional human upbringing of a family. Similarly, I think the premise of exploring the intersection of dragon and human culture is interesting and is delivered in a way that sustains intrigue. Janine Webb delivers some good characterisation. For example, Wu Mei likes coffee, when it is customary for dragons to drink tea and this is frequently pointed out. Furthermore, Lady Feng’s motivations are very clear. Her desire to repay the debt for killing the child make sense. Also, when things start going wrong with the child, she thinks she may be able to use the child to influence the market, by having more of an understanding of human behaviour. My main issues with this book is the pacing and the general lack of a plot. Some sections were extremely long, such as a very long scene with Lady Feng at a business gathering. Yet other aspects of the story are glossed over entirely. For example, long periods of Long Wei’s upbringing are summarised. There also feels like a lack of direction to the narrative. It is interesting, but there isn’t enough conflict and it is paced so quickly that most of the development and conflict is glossed over. I think this novella has the potential to be a good story, if it was rewritten and better developed. It may be of interest if you are particularly in to dragons or enjoy stories with good world-building and don’t mind a poorly executed plot. « Time’s Convert (All Souls Universe book 1) by Deborah Harkness (book review).